Don't think of a table lamp as a provider of light only. 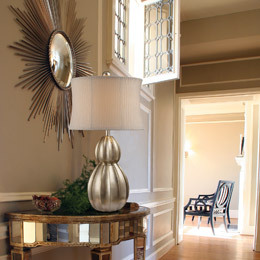 If you fall in love with a lamp because of it's amazing color, you can use that lamp as a unifier of the room design. Pick up on that color with other decor in the room--pillows, drapes, pictures, or ceramic ware. If you have a long cabinet or table and want to use two lamps on it, separate them by two or three feet. That way the light is better distributed in the room. Also, lamps look odd if clustered together whereas other decor items like picture frames, candlesticks, and vases work well in clusters. If you are getting bored with your perfectly good lamp, try changing the shade for a different look. 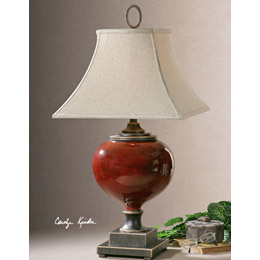 Just remember to check the old shade and see how it sits on the base so you'll be sure to get a shade that will work with your lamp. A lot of shades have a spider fitting--it has a little hole in the middle that sits on the top of a harp (the wire piece that goes around the bulb). Another type of fitting is a shade that sits on hardware attached to the bulb's base. And some smaller lamps have clip-on shades that sit right on the bulb.